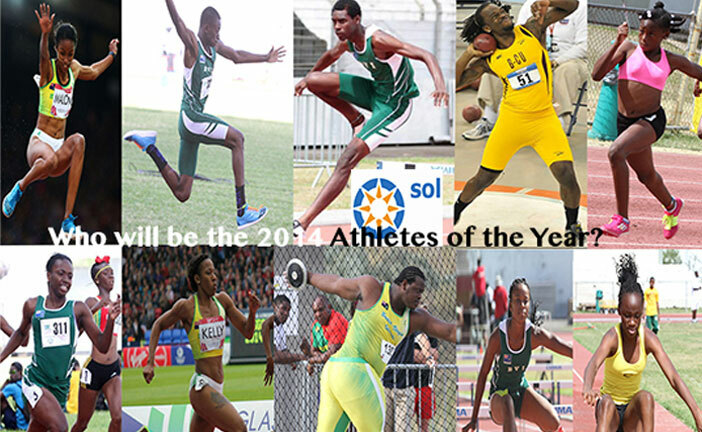 DECEMBER 9–Following the second longest season in its history that ended on November 28, the BVI Athletics Association is gearing up for its 6th Athletes Awards Gala, where its partner Sol will dole out the 2014 Athletes of the Year Awards in Youth, Junior and Senior divisions. On the heels of a competitive and successful season, there has been a record 23 athletes nominated for the awards by Sol in all six divisions. The forthcoming event is scheduled for 7 p.m. on Saturday, Dec 27 at the Moorings. Donation is $50 single and $85 per couple. Sol will also dole out awards to athletes who have established a National Records that stood at season’s end. Records began tumbling on January 15 and ended on May 18. In all, there were 13 National Records established including 12 individual marks during the season. A record was also established in the Jr. Girls 4x100m Relay. During the evening, the Most Outstanding Athletes Awards from U9 through the Open Divisions in track events, field events and combined events will be presented as well as the Most Improved Athlete, and the Comeback Athlete of the Year. The Coach of the Year will also be named. Awards for Road Racing will also be presented and two early contributors to the development of the organization will receive Lifetime Achievement Awards. Following are the respective nominees in the different divisions.